We are in the process of trying to decorate our house and it is grueling! I know I should just enjoy it and most of the time I do. But I can’t stand the transitional phase and this house is not only bigger than our old place, but the wall space is just…immense. So I have been on the hunt for artwork, shelves, curtains and decorations that mean something to us. It’s hard because part of me just wants to run out to Marshalls and grab up a bunch of prints just to get something on the walls, but I know I wouldn’t be happy with that so I wait. I wait and wait and stare at the bare walls hoping that one day inspiration will come. 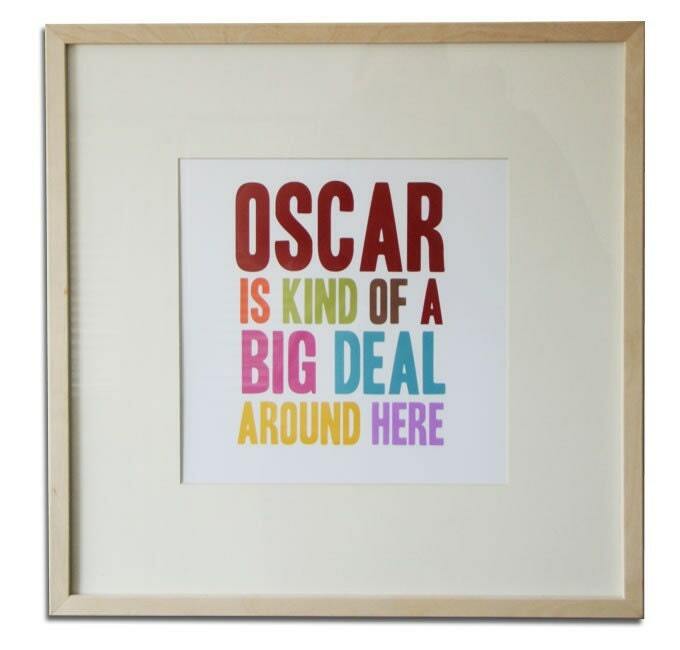 You just don’t see things with the name Oscar in them very often and I love it! As it turns out, the masterminds behind Penny People have an Oscar of their own. Now I just need to choose the colors and I don’t know maybe get one for Baby U2 as well?? All I know is I see good things. My walls won’t be bare forever. Rome wasn’t built in a day. Uuuuuhhhh! How stinkin cute is that! I must have it for Jack!